One of the comments on last week's post about the review of Victoria Legal Aid's fee structure pointed out that it isn't just the move to a whole of job system that will impact on potential VLA clients. Next year some people will be ineligible for aid who would have been eligible under the existing guidelines. 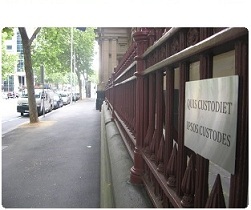 In Victoria, under the current guidelines, there is a distinction between the eligibility criteria for pleas of guilty and pleas of not guilty. The review has concluded that there is no reasonable basis for this distinction, and recommends standardising the eligibility threshold to that which is currently in place for a plea of guilty (refer 4.1.4(a)). This would save $475,000 but would mean that people who face a low level community based order (“CBO”) or a fine, will no longer qualify for a grant of legal aid, and will be required to either, appear unrepresented, receive limited assistance from a duty lawyer, or pay for a private practitioner. This measure is expected to impact 4% or 950 summary crime cases which are currently eligible for legal aid. This equates to 1.2% of the current duty lawyer population of clients. The table referred to in the paragraph above describes the current Summary Crime Penalty Threshold. For pleas of not guilty that threshold is an assessment by a legal practitioner of a likely penalty upon conviction of a fine in excess of 7.5 penalty units. (This doesn't mean that an applicant will automatically receive aid if the likely penalty is above the threshold, but they are eligible to apply.) Under the new proposal, that threshold will rise from a likely penalty in excess of 7.5 penalty units to a likely penalty of more than 200 hours of unpaid community work. The graph below from the SACs Community Sentences in Victoria: A Statistical Profile suggests the proportion of these people potentially impacted by a change in eligibility. (The research for the report was done in 2007. The number of offenders awarded CBOs has gone up by between 500 - 100 since then). 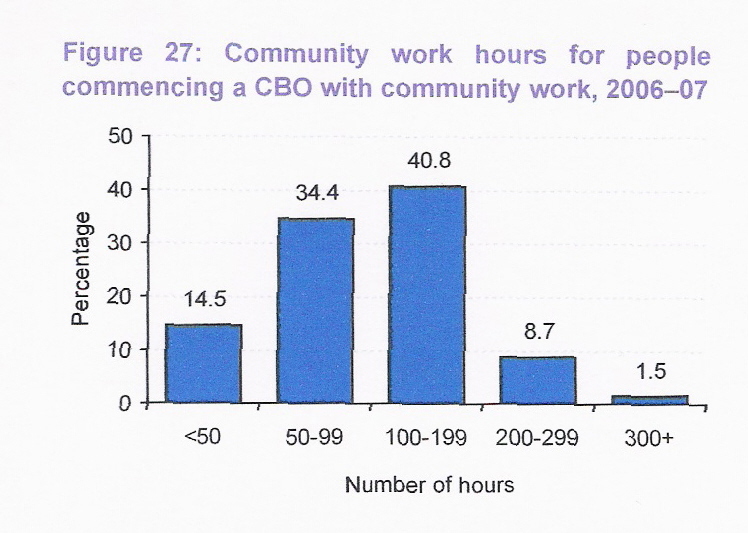 A couple of years ago, the number of people awarded more than 200 hours of community work accounted for just over 10% of those awarded CBOs. I doubt that has changed much. Even though CBOs of up to 500 hours can be imposed, the stats suggest that a 200 hour CBO is at the heavier end of the scale. At that level of seriousness the work component takes a couple of years to complete and a sentence of some kind of imprisonment is starting to become a real possibility (especially if there is not much said in mitigation). In R v Halligan  VSC 279 (discussed here back in June) the young offender was initially sentenced to 150 hours of community work for his involvement in a robbery, aggravated because of his presence at another robbery earlier the same evening where the victim had been beaten to death. In Matthews v The Queen  VSCA 177 the offender was awarded 50 hours of community work for a violent aggravated burglary where he broke into the home of a former partner and assaulted one of her friends. Of course, in both of these cases the accused would have received representation because the charges were dealt with in the higher courts. If they were dealt with in the summary stream, neither accused would be eligible for aid under the new arrangements. Section 25(2)(d) of the Charter of Human Rights and Responsibilities Act 2006 provides a heavily qualified right to legal representation. Dietrich v R (1992) 177 CLR 292 confirmed that permanent stays may be imposed where a trial judge apprehends that a lack of legal representation may lead to a miscarriage of justice. The majority qualified this right by reference to a serious offence, without providing much guidance as to when an offence should be considered serious. This application for special leave to appeal seeks to raise the question whether the applicant's trial in the County Court at Melbourne miscarried by virtue of the fact that he was unrepresented by counsel. In our opinion, and in the opinion of the majority of this Court, the common law of Australia does not recognize the right of an accused to be provided with counsel at public expense. However, the courts possess undoubted power to stay criminal proceedings which will result in an unfair trial, the right to a fair trial being a central pillar of our criminal justice system. The power to grant a stay necessarily extends to a case in which representation of the accused by counsel is essential to a fair trial, as it is in most cases in which an accused is charged with a serious offence. Deane J [at 14] defined a non-serious offence as "where there is no real threat of deprivation of personal liberty" but declined to provide further clarification. It's unclear how he would have regarded hundreds of hours of community work. A CBO is entered into voluntarily, but in the knowledge that if the invitation is not taken up other sentencing options will be considered. It will be interesting to see whether there are many applications for stays and appeals based upon a lack of representation, as a result of these changes. Not much will change. Nobody knows what 'likely' means and nobodies going to get sacked if they get it wrong. The people who need funding will stil get it and it will be easier to say 'no' to the people who don't. Realist, you should change your name. I'm not going to make any suggestions but the present moniker doesn't suit. People already *are* getting denied funding who ought to be getting it. There's a misnomer in the public mind that courts are all about punishment and retribution. Actually they perform a far more useful function when getting help for me who need it (sometimes whether they want the help or not). When a duty solicitor does a plea of guilty they have a tiny window of opportunity to hear about that person's circumstances and put them before a magistrate. When a grant of aid is available a lawyer can conduct a proper assessment and make recommendations to the court about what would most likely reduce the risk of coming before the court again. Another misnomer is that lawyers draw out the process and complicate matters. If someone appears in person, gets put on a CBO, breaches it because of work commitments, gets put before the court again and resentenced, there's a lot more time and public money getting wasted than there would have been if an appropriate penalty had been imposed in the first place. The fact that it's also a better outcome for the accused and the community can be a secondary consideration, if you prefer. By reducing assistance VLA might be helping to balance their own bottom line. The system as a whole will suffer fot it. But 3rd paragraph down: "... when getting help for me who need it ..."
Possibly. Should read for *those* who need it, of course. The point I was trying to make was that the gatekeepers of the system willl change their interpretation of 'likely' so that people who need the Aid get it. This is something that I know a little bit about so don't go flaming me. In the examples given I think both both Defendants would still have got funding whether thier matters were in the Magistrates Court or anywhere else, and this will be true for other cases as well. How are duty solicitors to do pleas of not guilty?????????? DPP appeal in Kypri unsuccessful?